Patriot is the newest thing at California's Great America and is a fine example of breathing new life into an aging early 90s roller coaster (Their oldest being the Demon). Originally known as Vortex, the attraction made its initial debut in 1991 as a stand up coaster sporting a green track/black support color scheme. 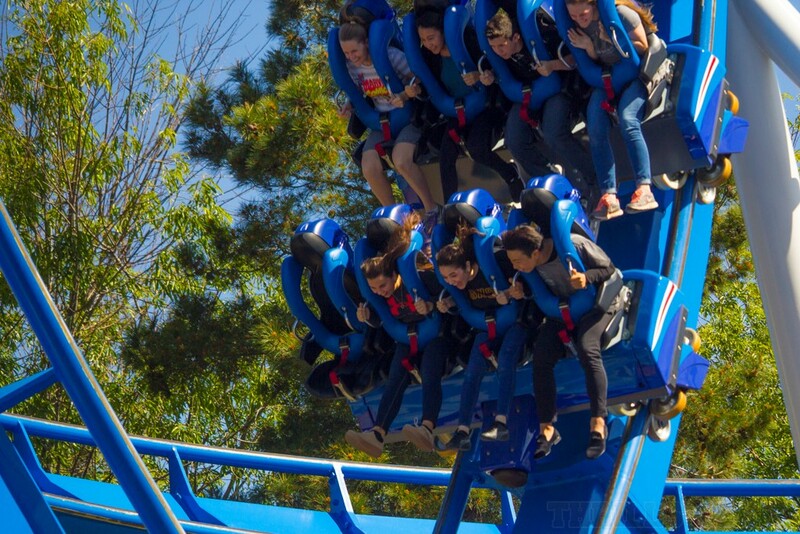 It was announced late Summer 2016 that Vortex would be giving its final rides on Labor Day Weekend and will reopen in 2017 as Patriot. 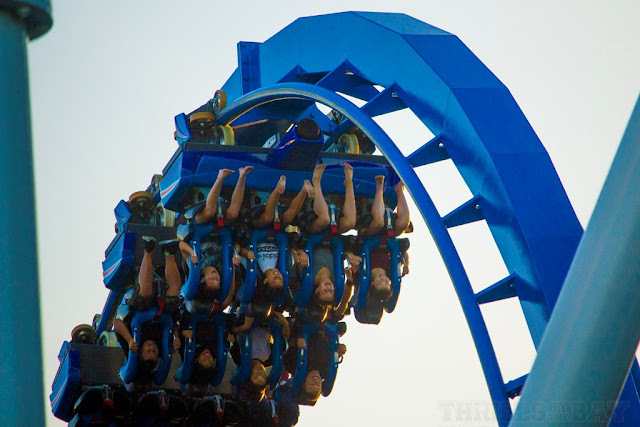 Patriot is the bay area's 2nd B&M floorless roller coaster in which riders ride sitting down with their feet dangling in the open air above the track. How did the conversion do for Patriot? 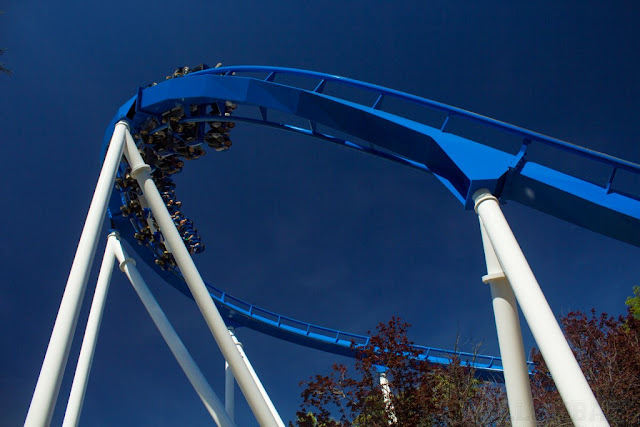 Vortex had become infamous for being one of the roughest B&M coasters out there (which B&M is known for smooth and comfortable experiences). A lot of the discomfort was due to standing up on blocky bicycle saddle-type seats and top-heavy trains. Also due to the nature of standing up, dispatch times weren't the greatest as it was frequent that riders would have to get their seat heights readjusted as they didn't "stand properly." The ride was certainly not the "must ride" at Great America anymore as the novelty of standing up is far gone. After the stand-up coaster "Rougarou" at sister park Cedar Point was converted to a floorless design, it was inevitable that our own aging stand-up coaster would be next in line. Rumors popped up throughout the last year up until the announcement. 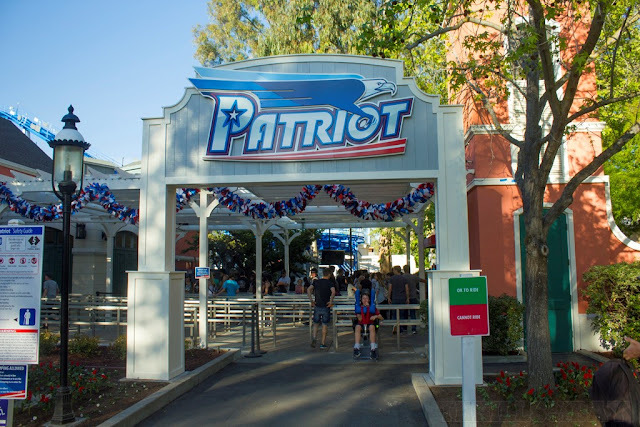 Patriot is a hugely improved experience has turned it from a ride we would occasionally do on a slow day to a ride that we now add to our list of rides we must do in a typical CGA visit. 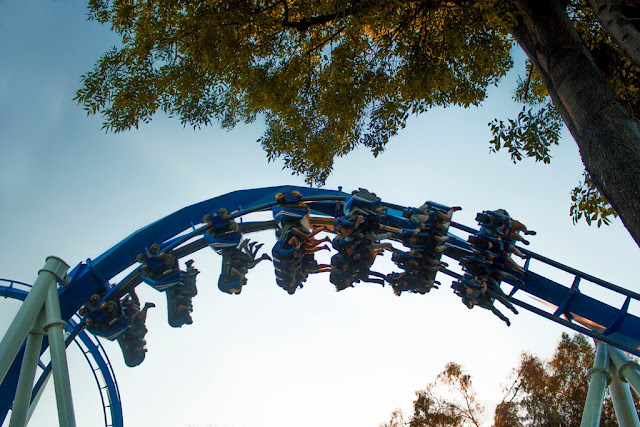 Don't expect the ride to be glass smooth as there's still a bit of rattle - the result of being one of the earliest B&M coasters made. The rattle is nothing like what it used to be in its Vortex form. 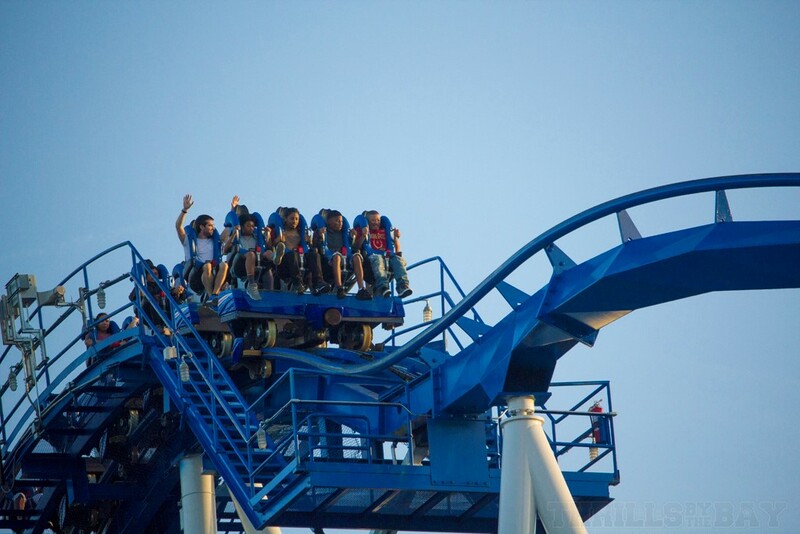 Now that we are sitting down riding it, we experience forces we had not seen before on this ride. 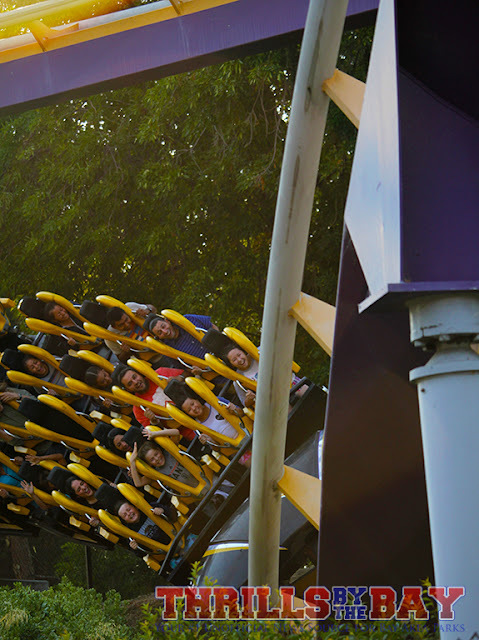 Initially coming out of the loop, there's some nice floaty hangtime, especially in the back rows. The snappy transitions are still there, but without the neck snapping. 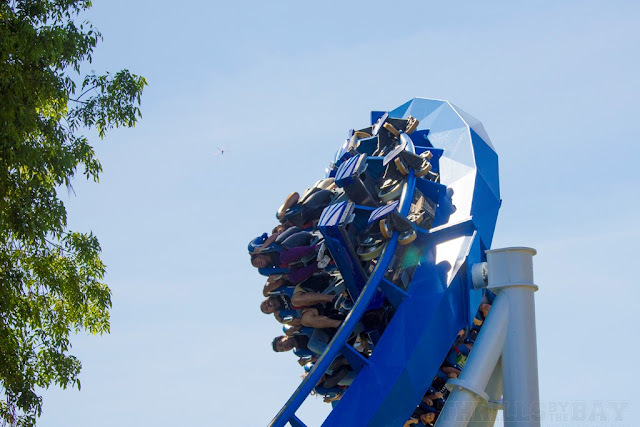 Coming up to the element we once dreaded - the corkscrew...The corkscrew has become a huge hit among us and other coaster fans, especially when sitting on the left side in the rear. As the train exits the corkscrew, there's a semi strong snap that lifts you out of the seat giving a nice zero-g feeling. We had also tried the corkscrew in the front seats and found our bodies being shot forward into the restraint. 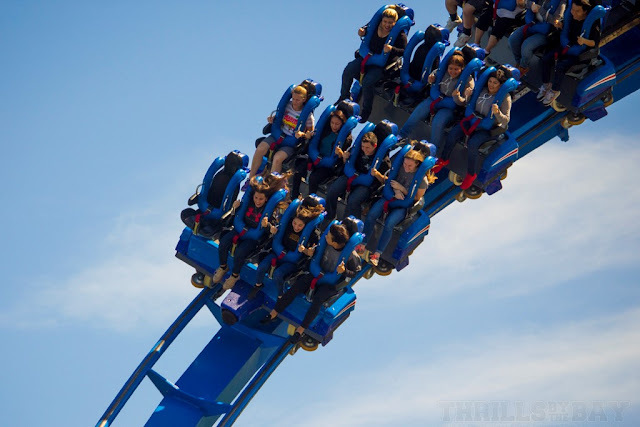 Not a painful experience but definitely something we've never felt on a ride before! Our favorite part of the ride, particularly in the rear left seats! Patriot is just the beginning of a new beginning for California's Great America, along with Mass Effect: New Earth - last year's revitalization project in the aging Action FX theater and as a whole, it feels like a brand new experience. It will also breath new life into the Hometown Square section of the park alongside the new Maggie's Smoke House upgrade. We highly recommend going out to the park and give it a ride again, you'll quickly see that it was quite an improvement to the old stand-up configuration. Did you get to ride Patriot? How did you like it compared to the former stand up configuration, Vortex? Let us know in the comments below!